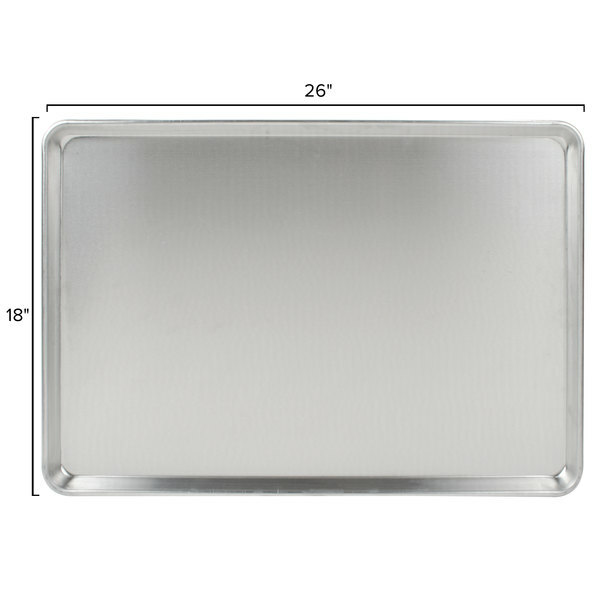 Advance Tabco 18-A-26 Heavy Duty Full Size 16 Gauge Aluminum Sheet Pan - Wire in Rim, 18" x 26"
Bake everything from chicken to cookies with Advance Tabco’s 18-8A-26 heavy duty full size 16 gauge 18” x 26” aluminum sheet pan. 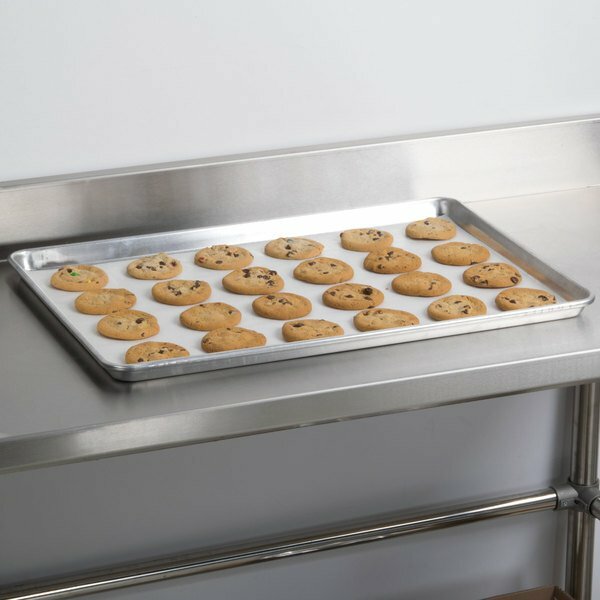 With the Advance Tabco 18-8A-26 hevy duty full size 16 gauge sheet pan, you can easily bake your delicious cookies, sticky buns, and rolls. 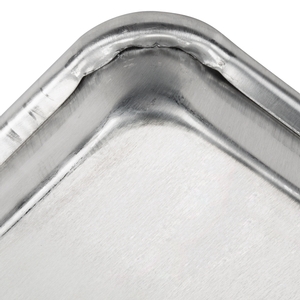 Die formed from one piece of solid aluminum, this product is an excellent heat conductor, making it ideal for high-volume bakeries, restaurants, and diners. This sheet pan also boasts a spacious 18” x 26” layout, so you can cook a large amount of food while cutting down on prep time. Best of all, you can even stack this product in your back-of-house area to optimize space. 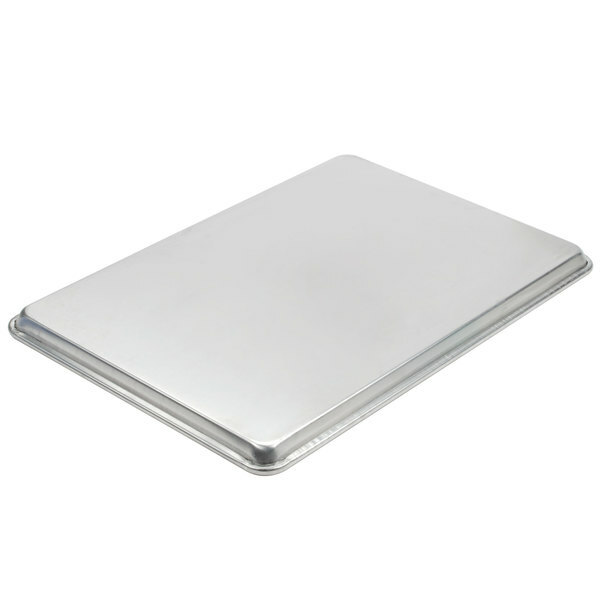 "These aluminum sheet pans are a good price and seem to hold up well in our very busy bakery. We have been using them for 3 months and are happy with them so far!" 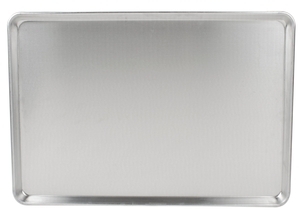 This pan features a wire enclosed in aluminum that surrounds the pan. The wire-reinforced rim offers anti-warping properties, helping the pan to maintain its strength and structure. 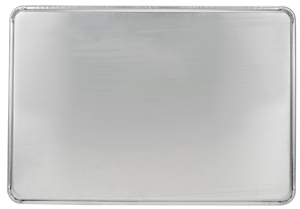 Since this sheet pan has a non-perforated design, it reduces the flow of air to your food. 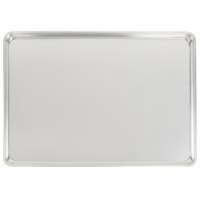 Using this sheet pan will result in chewier, doughier baked goods, making it ideal for baking rolls, biscuits, and cookies. 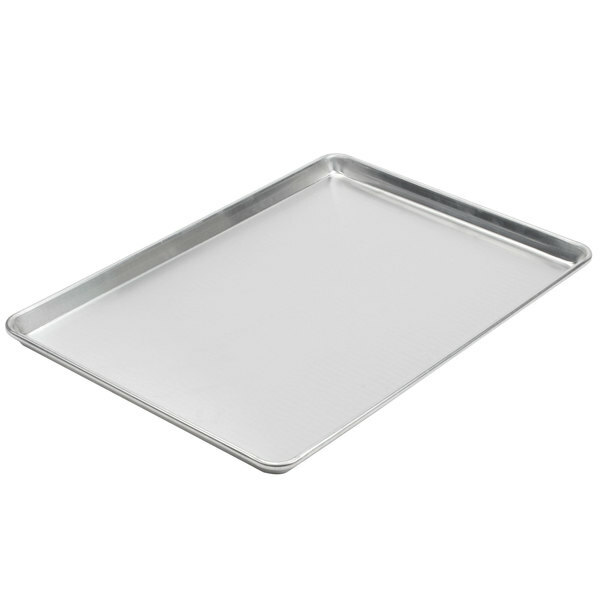 Item #: 10918A26 Advance Tabco 18-A-26 Heavy Duty Full Size 16 Gauge Aluminum Sheet Pan - Wire in Rim, 18" x 26"
Item #: 9369001 Vollrath 9001 Wear-Ever Full Size 16 Gauge Aluminum Bun / Sheet Pan - Wire in Rim, 18" x 26"
Item #: 32640694 Chicago Metallic 40694 StayFlat Full Size 16 Gauge Aluminum Customizable Sheet Pan - Wire in Rim, 18" x 26"
Advance Tabco 18-8A-26 Full Size 18 Gauge Aluminum Sheet Pan - Wire in Rim, 18" x 26"
Advance Tabco 18-8P-26 Perforated Full Size 18 Gauge Aluminum Sheet Pan - Wire in Rim, 18" x 26"
Overall User Rating: Advance Tabco 18-A-26 Heavy Duty Full Size 16 Gauge Aluminum Sheet Pan - Wire in Rim, 18" x 26"
Heavy duty for sure! 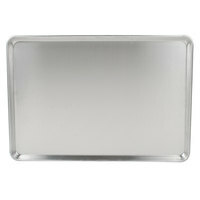 We put a variety of products on these sheet pans and then place them on the sheet pan rack. Some pans have 50 lbs. on them and works well. Super easy to slide in and out of rack and always cleans up nicely. Heavy Duty and great price! I use them for storage of parts on the regency 20 side load sheet pan racks, and it's working out great. 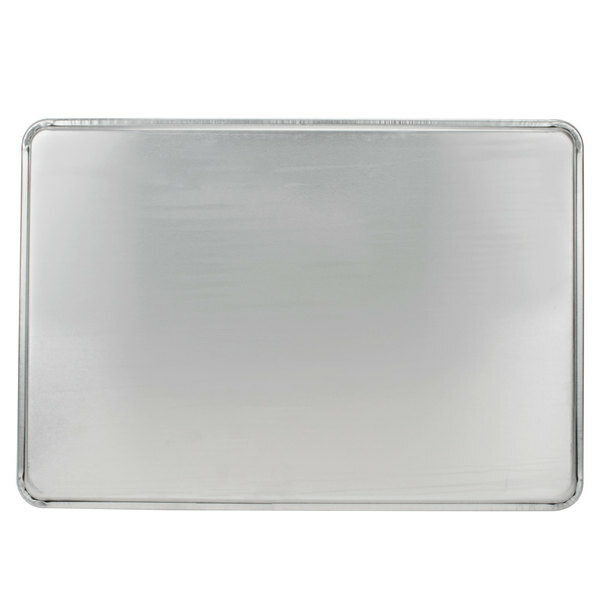 This 16 gauge aluminum sheet pan is fantastic for our everyday cooking. We use these all the time and love them they are so great! 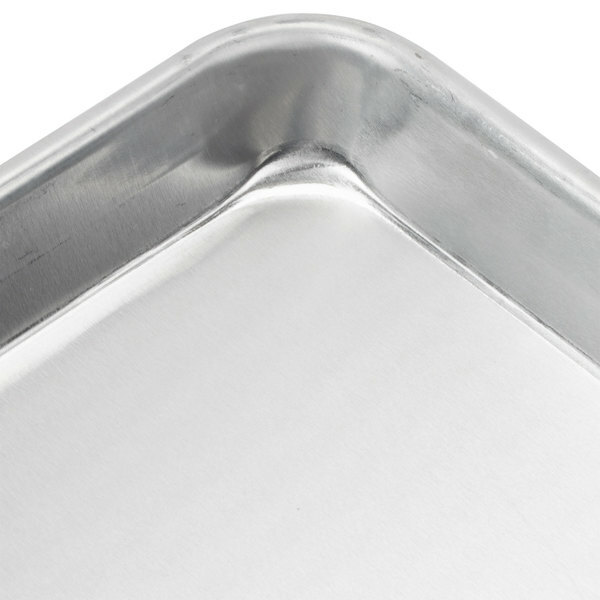 these sheet pans are everything i expected, sturdy with good quality edges and easy to clean. we use them in our henny penny and our commercial smoker. This is a great pan. Works very well. Our homemade rolls and cinnamon rolls turn out perfect every time. Much cheaper than other suppliers, i would recommend this item. We use these for everything; baking, roasting, shelving in the walk-in cooler. They have held up very well over the past 2 years. So far have not had to replace any. We bought these pans as a "better" option for large sheet cakes, brownies, etc. The are sturdier than the run of the mill pans but just lacking the strength i expected. Heavy duty pan at a great price. I actually use these as a drip pan, and they are very easy to clean. I highly recommend. These pans are fantastic--well constructed, heavy duty, and easy to clean. Definitely a steal for the price! They fit perfectly into our Blue Star oven. 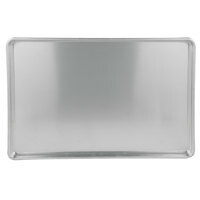 Excellent high quality sheet pans for a better cost than many other sheet pans. Easy to tell that these will stand up to years of use. Great product! I actually need to order more. So I am glad this showed up on here to leave a review. Haha will be adding a couple to my cart now. These full size pans are awesome. Can use for baking cakes and cookies. They cook evenly and clean really well. I would definitely recommend this product!! 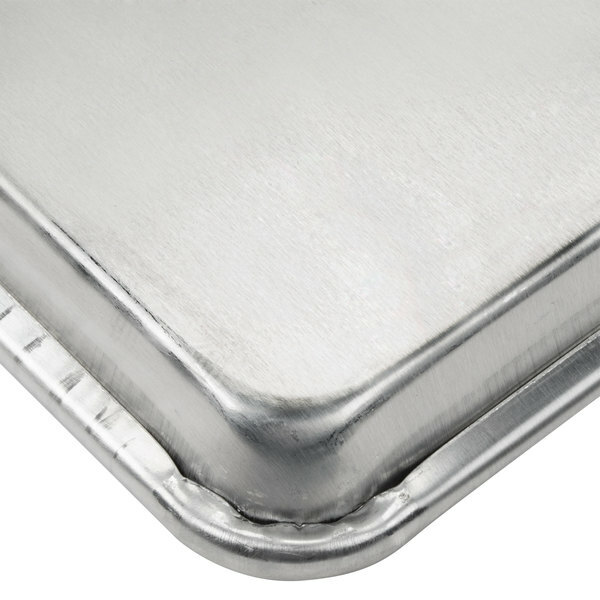 Super high quality, heavy-duty and durable, I'm very happy with these aluminum pans, I use them nearly every day, Highly recommenced. I will definitely purchase again. 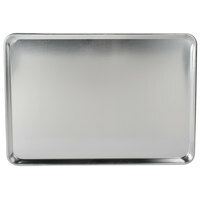 These are nice, heavy duty baking pans. Planning to buy them in half size too. Would last a long time. Definitely recommend this for baking. 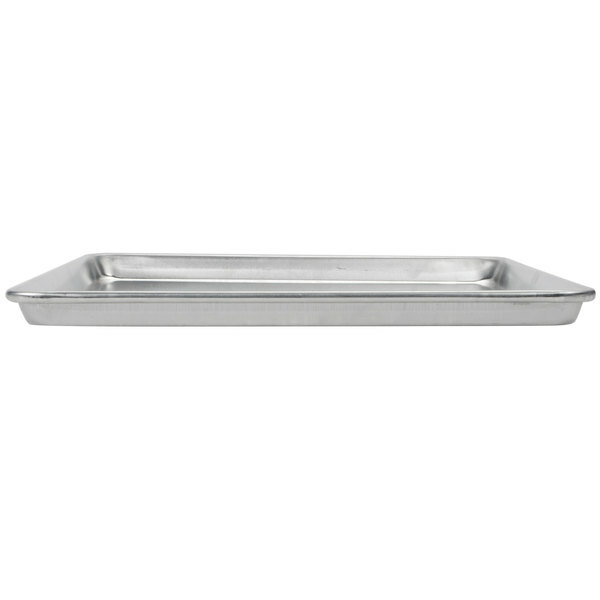 These aluminum sheet pans are a good price and seem to hold up well in our very busy bakery. We have been using them for 3 months and are happy with them so far! 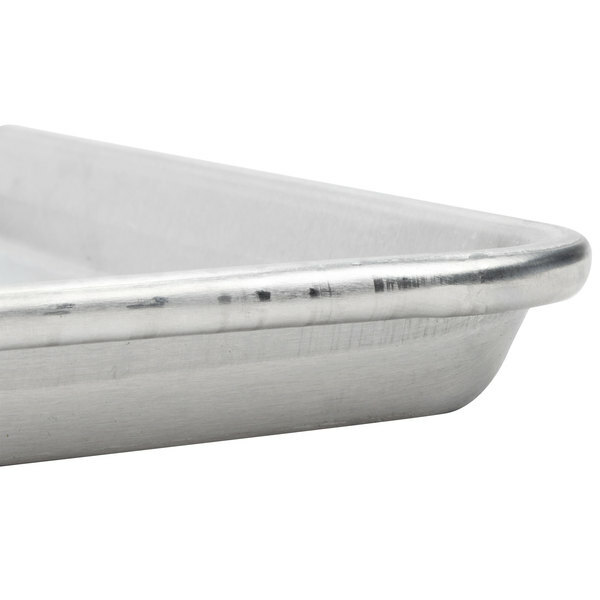 Use these sheet pans for baking and storing. Nice quality product for the price. 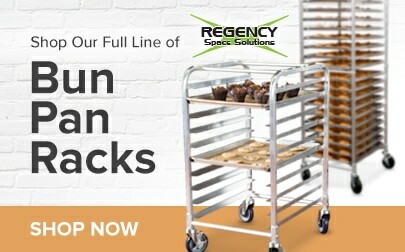 Fits perfect in a Regency 20 x 26 x 69 End Load Bun Rack. We are happy with our purchase of this heavy duty full size sheet pan. It's good quality. It is easy to clean. We would recommend. Wow this pan is HUGE. Pulling this shinny chunk of aluminum out of the box, my heart sunk a bit. I measured wrong and it was about an inch to big for my home oven. Took it in to the local rec center and the "little old ladies" that run the kitchen put it to work and they love it. This pan was badly scratched worse than pans I have used for years. The half size was scratch and stained, but I mananged to scrub it clean, although scratches are still there. Very disappointed. We are sorry to hear that. If your product arrives damaged, please let us know. The sooner we know, the sooner we can work to address the situation. 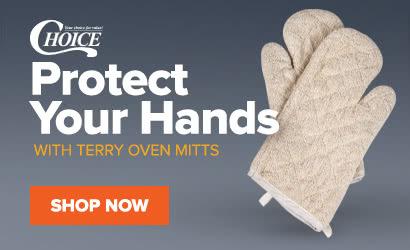 These are a must have in any kitchen! They are good for holding ingredients in a cooler and if you bake with them using parchment paper they will stay shiny much longer!! Wow this is a big pan. Quality craftsmanship. Heavy duty, excellant for preparation and cooking of baked and also use it in my smoker for roasting vegetables.